Here's WHY The WORD of GOD Is The Foundation Of Knowledge! You WORK with your hands. That's what you've always done. You're a farmer. That's what you've always been. You live in a small town in the deep South. That's where you've always lived. You've never traveled very far — you've never cared to. You enjoy a simple, uncluttered life — the good life. Your world moves, it a comfortable pace — the tortuous tangle of city "life" never held much attraction for you. And any day you'd choose your "slow Southern drawl" over the nerve-wracking sputterings of ulcer-ridden "Northern sophisticates." You're happy. And you're content. Because you've just been told to go to New York City, to Wall Street, to the heart of the urbane business world, and to Washington, D.C., to the steps of the Capitol, to the center of the strongest government on earth — to New York and to Washington, to the leaders of the nation, to unflinchingly deliver a searing censure, a face-to-face, eyeball-to-eyeball indictment of wanton sin, parasitic corruption and impending doom. Amusing story — but a bit "far out"? Born in Tekoa, a small town on the outskirts of the wilderness in the Southern Kingdom of Judah, a herdsman (Amos 1:1) and a "fig picker" (Amos 7:14), a "peasant," a "farm boy" and a "hick" Amos was commanded to go to the "sophisticated" cities of Samaria and Bethel, to these opulent resorts of pagan vice and social oppression in the Northern Kingdom of Israel, to prophesy and to preach the Word of God. Now all you Southern farmers need nut worry. God is not going to send you to Wall Street or to the Capitol. In this end-time society, God has called out more than just one lone prophet to do His Work. God's Work today is a massive operation — worldwide in scope. And as a result, God is building a body of multiple thousands of Co-Workers — all called out together, all united in the greatest team effort in the history of the world. Amos dedicated his Life to help his people. He cried for them (Amos 7:2, 5). He loved them. He was a great man. He was a great patriot. No matter who you are, what you are, where you are, no matter what your educational, social, economic, racial and religious background may be, you can play a crucial role in the Work of God today. You can save your family — and your entire nation. That's the great lesson of Amos: Anybody — everybody — can participate in God's Work — because God Himself has promised to help those whom He calls. Joseph — Historical Man or Hysterical Myth? While still a teen-ager, Joseph was sold by his jealous brothers into slavery. He ended up as a servant in Egypt, and was thrown in jail on trumped-up charges. Finally, events suddenly took a turn for the better. Pharaoh had a dream, and Joseph was brought forth out of the dungeon to interpret it. From the position of a lowly slave and a prisoner in a strange land, Joseph was thus raised overnight to a position of responsibility and honor second only to Pharaoh himself! Not only did Joseph explain Pharaoh's dream as a warning from God of an impending seven-year famine, but he went on to advise the ruler on how to prepare effectively for the calamity (Gen. 41). Pharaoh was so impressed that he immediately put Joseph in charge of all the food resources of Egypt. For seven plenteous years Joseph gathered Egypt's produce into granaries. Wheat was so plentiful that efforts to keep tally on the amount stored were abandoned. Joseph prepared all Egypt to face the famine. When the famine struck, the years of preparation paid off. While surrounding nations were starving, Egypt had food. Thanks to God's warning and Joseph's foresight, the nation was able to weather the disaster. Joseph emerged as the savior of Egypt — the one who had fed it and kept it alive during the famine. A fascinating account! But is it true? So Sunday-school-like does this story appear, so simple-minded and so fabulous, that critics have not been slow in calling it into question. Where, outside of the Bible, they ask, is there any proof that such a famine took place — or, for that matter, that there was ever even a Joseph? Egyptian history provides these answers ! I was in distress on the Great Throne, and those who are in the palace were in heart's affliction from a very great evil, since the Nile had not come in my time for a space of seven years. Grain was scant, fruits were dried up, and everything which they eat was short ...The infant was wailing; the youth was waiting; the heart of the old men was in sorrow... The courtiers were in need. The temples were shut up; the sanctuaries held nothing but air. Everything was found empty (James B. Pritchard, ed., Ancient Near Eastern Texts, Princeton: 1955 , p.31). Here is the situation as it was during the final year of the calamity, when "the land of Egypt... fainted by reason of the famine" (Gen. 47:13). Here is the account of the Biblical seven years' famine preserved on stone by the Egyptians themselves. But that's not all. The inscription goes on to show how Zoser, in desperation, turned for advice to his prime minister Imhotep. Who controls the flow of the Nile, the Pharaoh wanted to know, Imhotep then described to the king the nature of the God who alone could relieve Egypt from her plight. Zoser followed the sage's advice, the famine ceased, and the "borrowing from their granaries" was no longer necessary ( ibid. , p. 32). Ancient Egyptian documents style him as prime minister of Zoser. He had the ability to foretell the future (ibid., p. 432) and had written a book on wisdom. He was also remembered as being in some way connected with the supervision of granaries. In later ages idolatrous Egyptians forgot Imhotep's true personality and deified him as a god of medicine. In Zoser's time, however, he was regarded as a worshipper or a son of Ptah, the Egyptian god of creation. It is not hard now to deduce to which Biblical personality the qualities and deeds ascribed to Imhotep really belong. What prominent man in Egypt obeyed the Creator? Whom does the Bible identify as prime minister of Pharaoh? (Gen. 41:40, 41, 44.) Who in Egypt had "physicians" (health instructors) in his employ? (Gen. 50:2.) Who taught Pharaoh's ministers wisdom ? (Psalm 105 :22.) Who advised Pharaoh about the famine and distributed grain for food? Who was regarded as the savior of Egypt? (Gen. 47:25.) The personality and deeds ascribed to Imhotep belong actually to none other than Joseph! But, then, how did the deeds of Joseph come to be attributed to Imhotep? Remember that when a new Pharaoh arose, he "knew not Joseph" (Ex. 1:8 ). That is, he preferred not to know of or remember Joseph. When the Egyptians began to oppress the Hebrews they also erased the memory of Joseph from their minds and from their history. They chose not to remember the service he had performed. Whatever works of Joseph's could not be forgotten or erased were falsely attributed to other individuals, such as Imhotep — who was, probably, the architect of Zoser's step pyramid and a contemporary of Joseph. In time, the Egyptians really, "knew not Joseph." Imhotep was one of those who took his place, and was eventually deified. The cult of Imhotep, which boasted little idols or figurines of this patron god of medicine, became extremely popular in the second century B.C. Whatever had been remembered of Joseph was thus completely corrupted and transferred to an idol. Enough material has been preserved, however, to substantiate the Biblical account of Joseph's rule in Egypt and of the seven years' famine. Churches Do They All Teach the Truth? FIRST: Prove that the Bible is the inspired Word of the Living God. II Timothy 3:16 claims, "All scripture is given by inspiration of God." II Peter 1:21 adds, "For the prophecy came not in old time by the will of man: but holy men of God spake as they were moved by the Holy Spirit." The inspired Word of God — the Bible — is the Truth! And that's the truth. But you can't "believe on this paragraph." Prove it for yourself: Read our free booklet The Proof Of The Bible. SECOND: Begin to live by every Word of God. Jesus said, "It is written, that man shall not live by bread alone, but by every word of God" (Luke 4:4). And He added in Luke 6:46, "And why call ye me, Lord, Lord, and do not the things which I say?" The Bible teaches that we are to obey God by keeping all His Commandments. A young man came to Jesus and asked, "Good Master, what good thing shall I do, that I may have eternal life?" Jesus answered, "If thou wilt enter into life, keep the commandments" (Matt. 19:16-17). And Christ didn't change His mind and "do away with" God's Commandments either ON the stake of crucifixion or after His resurrection. He told His disciples in His last real talk with them, "If ye love me, keep my commandments... He that loveth me not keepeth not my sayings: and the word which ye hear is not mine, but the Father's which sent m e... I have kept my Father's commandments" (John 14:15, 24; 15:10). Jesus Christ kept His Father's commands — and taught His disciples to do the same (Matt. 28:20). THIRD: Find the TRUE Church of God. Much confusion exists on this point ! Many think that Christ is divided — that He has many different churches, all teaching "the" Truth. Yet how can this be when different churches teach opposite things about the Bible? People just don't think. The Apostle Paul asked, "Is Christ divided?" (I Cor. 1:13.) He reminded them that Christ is not divided and exhorted, "Now I beseech you, brethren, by the name of our Lord Jesus Christ, that ye all speak the same thing, and that there be no divisions among you; but that ye be perfectly joined together in the same mind and in the same judgment" (I Cor. 1:10). Somewhere on earth today the one true Church of God flourishes — it could never die (Matt. 16:18). And so it now becomes your responsibility to find God's true Church. And to prove it. How do you do it? The Bible gives clear-cut instructions. Which Church is literally called "The Church of God," is obeying God's Law, is a little flock, and is preparing the way for Jesus Christ's triumphant return by preaching and publishing the GOOD NEWS of TOMORROW'S WORLD? The answer should become obvious. We realize that only God can call and convert a person (John 6:44, 65) — so we are not a proselyting Church. But we must also realize that Christ commanded His servants to "Go ye therefore, and teach all nations, baptizing them in the name of the Father, and of the Son, and of the Holy Ghost [Spirit]: teaching them to observe all things whatsoever I have commanded you" (Matt. 28:19-20). And that is precisely what we are doing! So, if you want to know more about this very Work of God, then write and ask for a personal visit by one of our Ambassador College-trained representatives. There is one in or near your city. And he knows exactly where God's true Church is today. "Their land is also full of horses, neither is there any end of their chariots: Their land is also full of idols; they worship the work of their own hands, that which their own fingers have made" (Isaiah 2:7, 8). Who's Isaiah talking about? The ancient house of Jacob historically — and the United States and Great Britain prophetically. What's Isaiah talking about? Materialism generally — and perhaps automobiles specifically. The 1970 A.D. idol is different from the 725 B.C. idol. A leering statue is not an American or British idol. But a leering automobile is. Because America's land today is literally full of "iron chariots." The nation is loaded with two-car families. In the mid-1950's the number of automobiles passed the number of families, And still it continued to grow, Likewise the installment debt. Today 70% of new cars are bought on time. And many are traded, sold or junked before they're ever paid for. In 1967, passenger car, truck and bus mileage in the U. S. amounted to 4,826 per person. Total miles driven 965,132,000,000. In that year about 400 gallons of gasoline were consumed per person. In 1968, another 10,718,000 cars, trucks and buses rolled off the factory assembly lines. This made an unbelievable total of 101,018,000 registered cars, trucks and buses, For every two citizens, there was either a truck, bus or passenger car. In 1970, we can all tragically "look forward to" over 65,000 people being killed in traffic accidents in the U. S and Canada. "The waters mounted, and lifted the ark so that it rose above the earth. The waters rose and increased greatly on the earth, so that the ark floated on the surface of the waters.... "Then God remembered Noah ... At the end of one hundred and fifty days the waters subsided, so that on the seventeenth day of the seventh month the ark grounded on the mountains of Ararat" (Genesis 7:17-18; 8:1-5, Goodspeed). Is it still there? Does Noah's Ark still rest high up the slopes of Mt. Ararat? No question could excite more interest and fascination. And so once again the search is on for the most famous water craft in human history. High aloft the snowcapped reaches of modern Mt. Ararat, freshly discovered hand-hewn timbers of white oak, dislodged from their glacial prison, have stirred some thoughtful questions and raised multidiscipline interests as to whether humanity has indeed stumbled onto the legendary Noah's Ark. Too many hoaxes and disappointments in times past have worn thin the patience and belief of respectful onlookers — and have served to support the views of skeptics and cynics. But, in the minds of some Biblicists and scientists, this find is worthy of a thorough investigation — for something indeed is up there where it seemingly has no business being. So beginning this summer, a scientific expedition will assault the northwestern slope of Mt. Ararat in eastern Turkey. Using the most modern scientific and archaeological methods available, the team will attempt to uncover what seems to be an "ancient artifact" hidden beneath an ice lake at almost 14,000 feet altitude. Ferdinand Navarra, a French industrialist, is among the party. He ascended the mountain in 1955 with his son and chopped a five-foot piece of hand-tooled wood from the ice pack. This wood was found far above the normal timber line. In fact, there is no wood like it within several hundreds of miles — and no indigenous woods at ali grow on Ararat's slopes. Tests in Spain and France have indicated that Navarra's timber is 4 to 5,000 years old. (However, at least three highly respected laboratories — in California, Pennsylvania and England — have disputed this claim, quoting an age of only about 1200 years.) Navarra estimates that on his 1955 expedition he saw perhaps 50 tons of timbers embedded in the frozen lake — and estimated the length of the "strange object" at up to 400 feet. Could this be the remains of Noah's Ark? Only further investigations will determine the final answer. There have been reports down through the centuries of a large vessel high atop Mt. Ararat. In 1840, the prow of a ship was seen jutting from an ice pack by avalanche work teams. Aviators have intermittently reported seeing a ship-like shadow in the ice near the top of the mountain. Both the Babylonian historian Berossus (250 B.C.) and the Jewish historian Josephus (70 A.D.) attest to the fact that the inhabitants of the Ararat area have had ready access to the Ark. Marco Polo wrote in his Travels: "In the central part of Armenia stands an exceedingly large and high mountain, upon which, it is said, the Ark of Noah rested, and for this reason it is termed the mountain of the Ark." Are these reports factual — or do they merely reflect local superstitions, psychological suggestion, and wishful thinking? We simply do not yet know. The current expedition to unlock the hidden secrets of Ararat is sponsored by the SEARCH foundation, a nonprofit organization dedicated to "Scientific Exploration Archaeological Research." It is joined by members of the Arctic Institute of North America. Heading the expedition is British glaciologist Ralph A. Lenton, who participated in the first transantarctica crossing. Another member of the scientific team is Hugo A. C. Neuberg, a field physicist with arctic experience. During the summers of 1970 and 1971, the SEARCH foundation expects to spend in excess of $1,000,000 to remove some 900,000 cubic meters of ice and moraine to get at the enclosed object. Complex engineering techniques and radio ice-depth measuring equipment will be used to expose the artifact. The expedition has received every courtesy from the Turkish and U. S. governments for the project. This summer the plans are to send a 25-man team to the site — to study the glacier and determine the best method to reach the artifact. Next summer the major work of uncovering the artifact will be done. Said Robert C. Paylor, director of the Washington office of the Arctic Institute, "There never has been a glacier melted yet. What we hope we can find is a source of geothermal heat. Conceivably, one could drill into a volcanic mountain, put water in and get hot water out. That would save hauling a lot of fuel up there." The expedition's first task, he asserted, will be to map the shape of the 150-foot-thick glacier under which the timbers are buried. "Then," he added, "we will study ways of removing them without damage, possibly by utilizing steam from apparently volcanic heat sources on the mountain." Acknowledged experts in archaeology, geology, and Semitic languages have disputed the claim that Noah's Ark was found by Navarra in 1955. "Absolutely anything is possible in this world," said one — Dr. Foelich Rainey, University of Pennsylvania archaeologist. "But if there's anything that's impossible in archaeology, this is it." Yet, as James M. Lee of the SEARCH foundation said : "Something is under the ice on Mt. Ararat, where it has no logical business to be. If it's not the ark, what is it? " Declared Robert Faylor: "I can't explain how wood of that size and age could get to that height. Whatever is there, is going to be of great archaeological interest." The name Ararat means high ground and refers to a mountainous district of Armenia. The name was unknown to the geographers of Greece and Rome. However, the present mountain named Ararat by the Armenians is called Agri-Dagh (Painful Mountain) by the Turks, and Kuh-i-nuh (Noah's Mountain) by the Persians (Peloubet's Bible Dictionary). It could well be the correct site. Arguri, the only village known to have been built on its slopes, was the spot where, tradition says, Noah planted his vineyard. Is this indeed the right mountain? And are the timbers the remains of Noah's Ark? Hard evidence is still sketchy. We can only await the results of the SEARCH expedition. 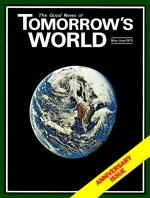 TOMORROW'S WORLD is keeping close watch on developments — we will keep you informed. Those of you reading this magazine have been receiving tremendous knowledge — knowledge which surpasses anything imaginable — knowledge for which you are now responsible. You have been receiving knowledge of the Living God! You know His Plan. You know His overall purpose for all mankind. You know the scope of God's Work. You who have been reading The PLAIN TRUTH and TOMORROW'S WORLD regularly, you also know the awesome magnitude of the cataclysmic events looming on the horizon. Through the pages of these magazines, plus the other articles, booklets and reading material you have received from Ambassador College, you have been saturated with the truth of God. You have already heard the true Gospel of Jesus Christ. You have been privileged to understand the mysteries of God that hare been hidden from all the world (I Cor. 2:6-10). You have learned there is a way of escape — but only one way — the way of repentance, the way of self-sacrifice, the way of wholehearted dedication to God's Work. This is the absolute truth of God. YOU know it is the truth. And that KNOWLEDGE IS DANGEROUS!